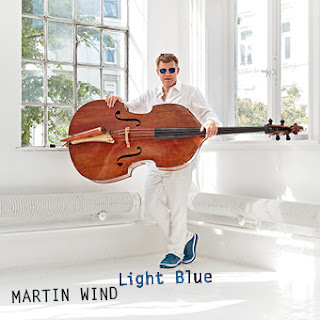 Laika Records (Germany) will release Martin Wind's LIGHT BLUE today, March 2, 2018. The recording, his 20th as a leader or co-leader, features old friends: Anat Cohen (clarinet), Ingrid Jensen (trumpet), Matt Wilson (drums), Scott Robinson (multi-reeds), Bill Cunliffe (piano), Gary Versace (piano, organ), Duduka DaFonseca (drums) and Maucha Adnet (vocals). There are milestones in a musician's career, and life for that matter, which pass without acknowledgement. What with rehearsals, travel, and recording sessions, a busy professional rarely has the opportunity to note a watershed moment. With the realization of his latest release LIGHT BLUE, Martin Wind registers the significance of this moment in time. This recording comes some twenty-five years after recording his first release as a leader, Gone With The Wind (September Records), twenty years since he recorded in New York, Family (A Records), and LIGHT BLUE is being released shortly before he turns fifty. Since that initial outing, Wind has released another 18 albums as a leader or co-leader and he has become one of New York's most in-demand bassists. Wind recorded LIGHT BLUE with engineer Matt Balitsaris at Maggie's Farm in April 2017 in between a myriad of gigs including backing singers Dena DeRose and Ann Hampton Callaway, Ted Rosenthal's Monk Project, showcasing his quartet in Los Angeles, and performing with Pat Metheny and Matt Wilson at the Wichita Jazz Festival. The remainder of the year found him touring with Matt Wilson's "Big Happy Family" (performing Honey And Salt, the poetry of Carl Sandburg), presenting Schubert's "Trout Quintet" and the premiere of his composition "Looking Back" with the American Chamber Ensemble, and performing George Gershwin's "Rhapsody in Blue" with Ted Rosenthal and Phoenix Symphony. Somehow he also found time to tour with his partner, the legendary Belgian guitarist Philip Catherine. LIGHT BLUE is actually two recordings. Side A: LIGHT features the Martin Wind Quintet with Scott Robinson, Ingrid Jensen, Gary Versace, and Matt Wilson, all musicians Wind has performed with on an almost continual basis. Wilson and Jensen can be heard on Wind's very first New York recording, and the bassist is a member of the drummer's quartet Arts & Crafts, as is Versace. Robinson has been a member of the Martin Wind Quartet since it's inception in 2007. Side B: BLUE is a new group of old friends called, "De Norte a Sul". This group shares multi-instrumentalist Robinson with LIGHT. Cohen and Wind formed the group NY3 with Wilson in 2014, and besides performing Brazilian music with Maucha Adnet and Duduka DaFonseca, Wind's son and their daughters have become great friends. This is the first time Wind's music has included a vocalist and lyrics written for his compositions. Adnet maneuvers the Brazilian-favored Portuguese and English lyrics with a remarkable beauty. Besides being a master musician, Wind penned the ten compositions heard on LIGHT BLUE. There are seven new pieces and three that are new versions of some of his "classic" compositions, such as "10 Minute Song" and "Cruise Blues," both from his quartet recording Salt 'N Pepper (2008), and "A Sad Story" from Gone With the Wind (1993). His skills as an arranger are evident here, as they were on the critically acclaimed Turn Out The Stars (What If? Music, 2014), on which Wind performed music written or inspired by pianist Bill Evans with his quartet, plus the Orchestra Filarmonica Marchigiana. The artist was born in Flensburg, Germany in 1968 and he took third place in the International Thelonious Monk Bass Competition in 1995. In 1996 he moved to New York. He earned a master's degree in jazz composition and performance in 1998 from New York University and now is on the faculty at NYU and Hofstra University. He performs solo, in duo with Philip Catherine and Ulf Meyer, leads his own quartet, and is a member Matt Wilson's Arts & Crafts, Bill Cunliffe Trio, Bill Mays Trio, Dena DeRose Trio, and many others. He has also performed and/or recorded with the following artists: Guidon Kremer, Christoph Eschenbach, Mstislav Rostopowitch, Lalo Schifrin, Monty Alexander, Pat Metheny, Clark Terry, Mark Murphy, Slide Hampton, Toots Thielemans, Buddy DeFranco, The Metropole Orchestra, Radio Big Bands Cologne, Hamburg, Frankfurt and Berlin, Michael Brecker, Randy Brecker, Eddie Daniels, Curtis Fuller, Phil Woods, Bud Shank, Johnny Griffin, Bucky Pizzarelli, Mike Stern, Larry Goldings, Johnny Mandel, Frank Wess, James Moody, Hank Jones, John Scofield, Sting, Ann Hampton Callaway, Michel Legrand, Mulgrew Miller, Ken Peplowski, Anat Cohen, Benny Green, Vanguard Jazz Orchestra and others.